Wow.... five days of the 10 Days of Teaching Music have passed. Have you enjoyed the other 10 Days posts by my fellow bloggers in the iHomeschool Network? I have been overwhelmed with the amount of ideas and creativity circulating in the blogosphere this past week! I have to admit... I think today's topic is probably my favorite, just because we've all been enjoying it so much these past few weeks. Interest Led Learning is an integral part of our homeschool! My children's interests can also lead me to music study as well. Currently, there is a Star Wars obsession in my house. My son is CONSTANTLY humming the music. I have heard from other moms of boys this age that they do the exact same thing. Why not put this obsession to good use? And guess what? My ten year old (who is obsessed with Harry Potter) loves this study, too! Our whole family loves John Williams. He is perhaps the most prolific composer of our generation. We have been learning about John Williams, the composer of the Star Wars film score. He is also the composer of MANY other film scores (such as E.T., Harry Potter, Raiders of the Lost Ark... the list goes on an on!). The piece I chose for us to analyze was The Imperial March, from Star Wars. This interview with John Williams about the music is very interesting. Why not create a John Williams Pandora Station? How about search for John Williams on YouTube? If you use Spotify, all of his music is at your fingertips! Start doing some research online about John Williams. 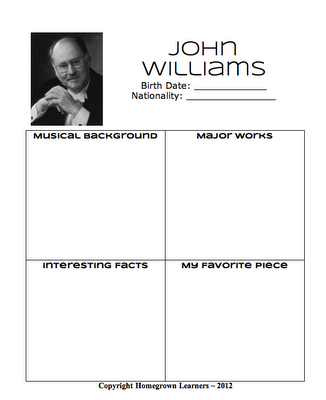 What about using John Williams music for SQUILT notebooking, too? 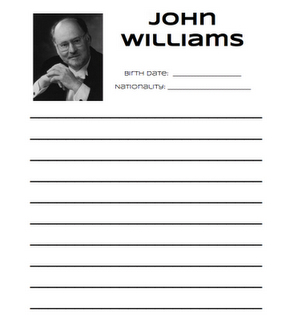 I've created some John Williams notebooking pages for you to download. 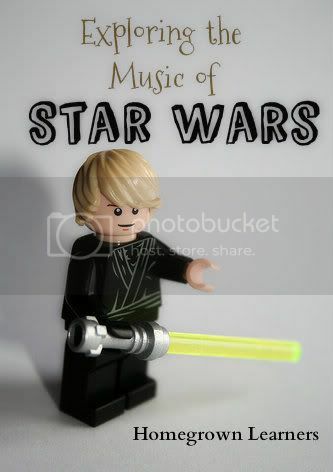 Nothing warms my heart more than my little guy humming Star Wars and using his light saber as a conducting baton to conduct the orchestra "like John Williams does"! Does your child have a passion that you could incorporate with music? I'd love to know! 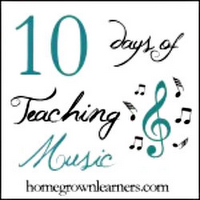 *For more SUPER EASY Music Appreciation lessons, visit SQUILT Music Appreciation, home of my curriculum, SQUILT! The 10 Days Series is organized by iHomeschool Network, a collaboration of outstanding homeschool bloggers who connect with each other and with family-friendly companies in mutually beneficial projects. Visit us on Facebook, Pinterest, and Twitter. And of course, visit all the 10 Days posts from these homeschool moms of the iHomeschool Network. You'll be blessed with tips on how to handle bad days, cultivating curiosity, teaching with Legos, and much much more!